This question was one of the prime motivations for a recent exploratory research study IU colleague and co-author Dr. Brent Gault and I conducted. Resources for elementary music programs as pertains to specialist faculty, time for instruction, and space and materials are perhaps especially vulnerable to cutbacks and fiscal instability. This is perhaps partly due to the relative lack of community visibility that elementary music programs enjoy in comparison to secondary school music programs. We were curious as to what types of experiences might be left over for students should elementary music specialist-led programs be cut – and how those experiences might vary for students from different demographic segments of the nation? We analyzed publicly available data from the Early Childhood Longitudinal Study (ECLS) conducted by the National Department of Education, Institute for Education Sciences, and the National Center for Educational Statistics. The ECLS collected data about a nationally representative cohort of approximately 3.8 million kindergarten children (K class of 1999) as they progressed through elementary and middle school. Regarding music, the ECLS collected information about the nature of the musical experiences the children received in their academic classroom setting as opposed to their music class-specific experiences. 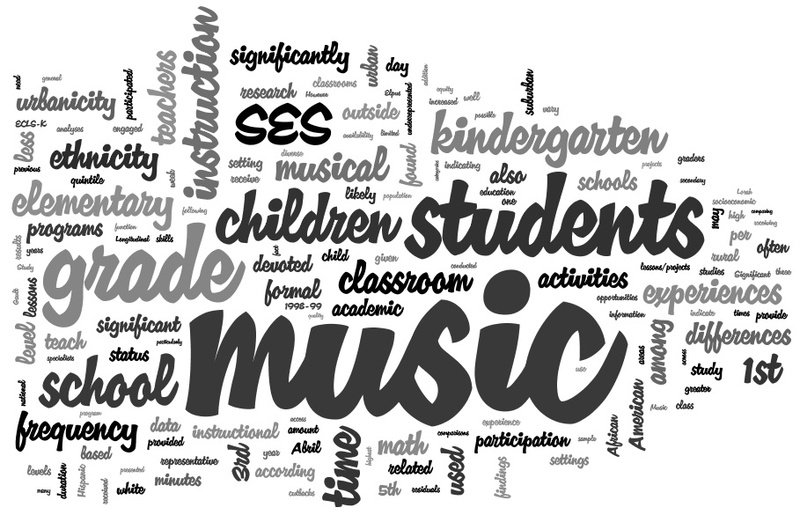 As such, the data allow for a rough estimate of the kinds and amounts of musical experiences students receive from their academic classroom teachers apart from those that may be delivered from an elementary music specialist. We also examined each these types of experiences according to student urbanicity (i.e., rural, suburban, urban location), socioeconomic status, and race. We’re happy to report that the article is now available as an “online first” offering in the Journal of Research in Music Education. Miksza, P., & Gault, B. (online first, 2014). Classroom music experiences of US elementary school children: An analysis of the Early Childhood Longitudinal Study of 1998-99 (ECLS-K). Journal of Research in Music Education, 62, 4-17.